Home > Coventive Explains > What is Composite Ballistic Armour? Ballistic Armour is a generic term for a protective layer of material that protects a person or object from projectiles. These include low and high-velocity bullets (e.g. from handguns or rifles), flying fragments (e.g. from grenades or improvised explosive devices – IEDs) and missiles. There are also non-military requirements to protect from unexpected impacts such as those due to road debris, hurricanes, failed engine components and civil unrest. There is no single armour system that can defend against all threats. This means there are many solutions that can be used alone or in combination. The common requirement of all systems is to dissipate the projectile energy with minimal damage to the target. This requirement for energy dissipation is where multi-layer composites can provide some advantages. Composite materials made of many layers can dissipate energy through a wide range of mechanisms including delamination, fibre-matrix de-bonding, elastic deformation or tensile failure of the fibres, and cracking or plastic deformation of the polymer matrix. In practice, there are often a complex series of interrelated mechanisms. The layers can be combinations of fibre-reinforced thermoplastics or thermosets, or dry fibres alone. They can also be combined with secondary materials such as ceramics and metals. When considering the design and effectiveness of ballistic protection, the nature of the threat also needs to be considered. What is its velocity? What size and shape is it? What is its mass? And how easily does it deform? Whilst there have been many theoretical studies in this area, it is still hard to simulate or predict the interaction between a given threat and the associated protection. Therefore, physical tests in accredited firing ranges are commonplace when developing and proving the validity of solutions. Body Armour or Personal Armour is designed to protect the wearer’s critical areas (vital organs and arteries) against threats such as bullets, fragments or sharp weapons. UK police body armour must provide coverage of the five major organs: the heart, lungs, liver, kidneys and spleen. Such armour is commonly modular, allowing the user to vary protection for different scenarios, or to increase the coverage to groin, legs or arms. It is important that body armour has minimal impact on the mobility of the wearer so as not to hinder their ability to escape threatening situations rapidly. Home Office Body Armour Standard (2017). The UK police work to standards dictated by the Home Office Centre for Applied Science and Technology (CAST), which grade the protection through various levels (HO1 to H04 and SG1), detailed in Home Office Publication number 039/17. These standards have been adopted by other organisations across the world. US National Institute of Justice (NIJ) standards. These were created to define the standards of protection for US police officers but are widely used as a reliable best-practice testing regime. The performance of body armour is measured by the level of penetration of the projectile and how much energy gets transmitted to the wearer (the “back face signature”). In order to be effective, the armour must, of course, stop the projectile from hitting the wearer. However, a back face signature of between 25 and 40 mm of “bulge” is acceptable as part of the energy absorbing mechanism. This can cause bruising or minor injury to the wearer, but is preferable to the alternative. The armour can be “soft” in which the layers are made, for example, of unconsolidated woven or stitched materials, or “hard” in which the materials are consolidated or bonded into plates. For high-velocity protection, a heavier hard face of ceramic or steel can be used to distort, disintegrate or deflect a projectile before it enters an energy absorbing composite layer. Aircraft Armour is generally expected to counter high-velocity rounds in order to protect the personnel and equipment being carried in hazardous military environments. Since low weight is critical in aero applications, protection is often targeted primarily to key personnel such as pilots. Although hard face armour, as used for personal protection, has the highest ballistic performance, it is designed to minimise back face signature. In aero applications, there is less of a need for a small back face signature and so thicker but lighter fully-composite armour can be used. This is usually a combination of Ultra High Molecular Weight Polyethylene (UHMWPE) and glass fibres to provide the required ballistic performance and fire resistance. Aero armour uses the Home Office and NIJ standards relating to high-velocity projectiles as well as over-arching STANAG protocols (STANdardization AGreements within NATO countries covering a variety of defence requirements). Armour for aeroplanes and helicopters tends to be rather bespoke by nature and is therefore generally costly. Armour for ground vehicles is perhaps even more varied with external protection, internal spall liners and, more recently, anti-rocket propelled grenade (RPG) nets. 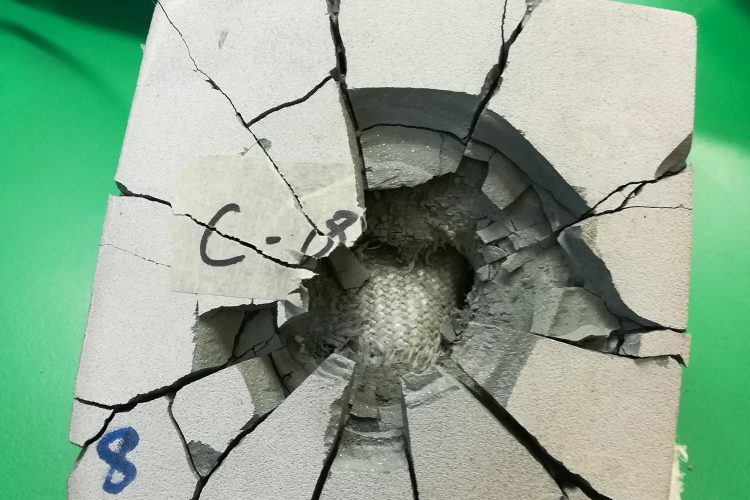 Composites play a role in both external protection (absorbing ballistic impacts) and spall protection (catching fragments that make their way through the structure). Because there are a variety of different threats, performance requirements and budgets, there is no single composite solution for ballistic protection. Furthermore, the specific details of individual ballistic products are often trade secrets. However, most modern composite ballistic panels are made from a variety of thermoplastic materials that can be combined in different ways. Heat and pressure, sometimes augmented with adhesive layers, can be utilised to bond laminates together into a finished panel. Unlike most other areas of composite production, an effective ballistic composite laminate is not necessarily the highly consolidated, low-void product that is normally sought. Rather, controlled under-consolidation can lead to products with more effective delamination or deformation mechanisms, thereby absorbing more energy under impact. 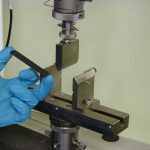 The only reliable way to optimise the ballistic performance of a composite panel is to tightly control and record production parameters and then test the resultant panels in repeated tests using real ammunition or high-velocity objects. Only when the desired results have been achieved with sufficient consistency will the product be accepted by a customer. Ballistic test ranges are tightly controlled areas with facilities for firing projectiles at known velocities in a safe environment. They will often have high-speed video facilities to allow examination of projectile entries and exits. The ammunition used for controlled testing is carefully calibrated for each round of tests, with the amount of propellant accurately weighed and loaded in order to achieve the required velocity. Depending on the requirements of the customer or standards, single or multiple shots will be fired at the test panels. A mineral or polymeric clay can be used as a backing if back face signature measurement is important. The success of a particular test will be determined by whether the ballistic panel prevents penetration of the threat and, if appropriate, whether the back face signature is within given limits. A common measure of a panel’s performance is “V50” – the velocity at which 50% of the rounds penetrate the panel and 50% are stopped. This can be regarded as the upper limit of a panel’s capability and therefore needs to be significantly higher than the desired performance. The design and processing of composite armour materials is a specialist activity, particularly when the aim is to reduce weight as much as possible. This is due primarily to the complexity of the energy absorption mechanisms. Coventive Composites has developed novel personal and aero armour solutions using innovative thermoplastic composites. We now have products that can be tailored for specific applications. Traditionally, ballistic panels have been expensive and heavy. 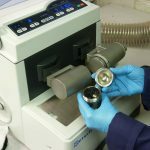 The solutions Coventive have been developing are, because of the materials we use and the way in which we process them, very cost effective and often offer savings in weight. Please feel free to contact us to discuss your requirements.